To SouthWest StageWorks Artistic Director Jamie Miller's surprise, a once obscure Shakespearian comedy resonated with Wilson High School actors. Specifically, Miller says the struggle between personal passion and familial and societal expectations evoked in "Love's Labour's Lost" hit home for students. "They're expected to give up youthful things and commit to a life of study. What resonated was the difference between everyone's expectations for them and the things that meant something to them. That's something I know that a lot of kids struggle with," Miller said. SouthWest StageWorks delivered its rendition of the play in mid-November as the Wilson High-affiliated theater company's first performances of the 2017-18 school year. However, this was not your ancestors' Shakespearean comedy. The play, adapted by Alex Timbers and Michael Friedman, was cut by an hour from the original version — clocking in at 95 minutes — and featured contemporary colloquialisms and references like Ted Talks, "bling" and "daddy issues." "The playwright and composer did a bang-up job of taking a second-tier Shakespeare script and really making it fun and modern," Miller said. The play's central plot follows the king, played by Diego Millan, and retainers to the king Berowne, Dumaine and Longaville, played by Aidan Sivers-Boyce, William Britton and Jackson Wray, as they halfheartedly attempt to honor an oath stipulating academic commitment and romantic avoidance. They struggle with this decision throughout and eventually embrace romantic clichés rather than stoic academia. Inevitably, the king falls in love with the princess, played by Julie Nauheim, while the retainers to the king fall in love with the retainers to the princess — Rosaline, Maria and Katherine, who are played by Lucy Grissom, Maddie Bradford and Jo Nagle. Initially, the women don't buy it. "They're just in love with saying they're in love," the princess says. In one of the funniest scenes of the play, the male characters dress up in mustaches and black sweaters as a spectacular gesture and act like German performance artists. They hope to surprise their counterparts, but the ploy doesn't work and the women pull off a trick of their own — coaxing the men into expressing their love for the wrong people. But in the end, the characters end up together. The play hints at serious themes such as classism and the differences between academic acumen and personal experience. But the actors also provide uproarious humor. Johnathan Price, playing Don Armado, delivered one of the funniest performances of the evening, strutting around in a swimsuit at times and other times delivering heartfelt soliloquies to barmaid Jacquenetta, played by Julia Meyers. But nearly the entire cast had at least one comedic moment. Miller says developing personal liberation and technical mastery simultaneously is a balancing act he helps Wilson actors master. "It becomes this really interesting split between at once taking the reins off of them, encouraging them to be energetic and trying big bold things without a fear of judgement — and at the same time, helping them learn the value of diciplined training," Miller said. The set included a cantina sign and a directional sign pointing to a pool, as well as a balcony and a sign showing the students' onerous oath. It was designed to mirror a class reunion located at a resort. "It was a fun process and there was a lot of student input into that," Miller said. The play also included brooding rock-oriented instrumentation while more than 60 Wilson High students acted, helped backstage or played music during the performances. 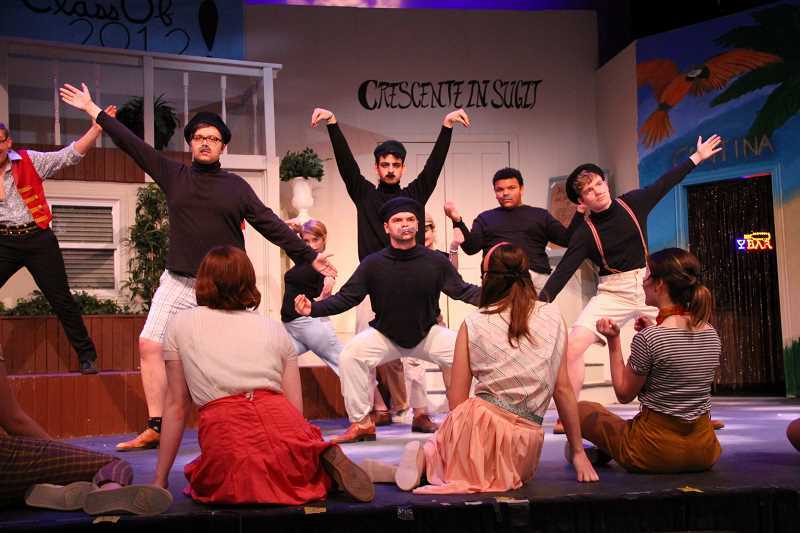 SouthWest StageWorks actors worked with myriad theater professionals throughout rehearsals, and Miller says this experience expedited the learning curve and provided knowledge about the professional acting world. Despite the cast's relative youth, Miller was impressed with their performances throughout the week. "One of the things that was really exciting about this process was these young people getting to partner with local professionals and really replicate the process they would find if they were to work in a local production," he said. "We had a sizeable number of people who it was their first show. 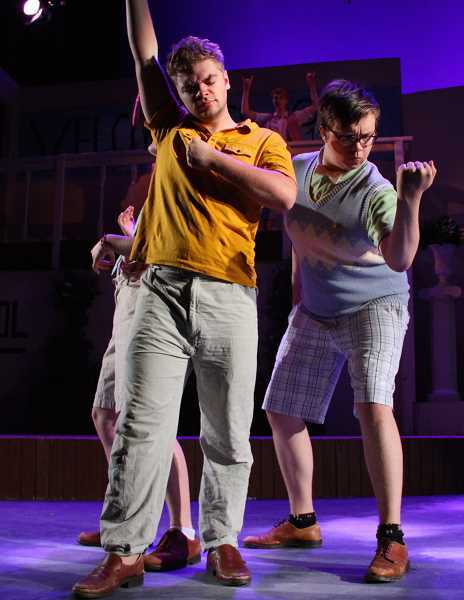 They stepped into a rigorous environment and put together a really good piece of theater."